We are glad to start our new "Weird tales" blog section, dedicated to the curiousities and weird things on the net. 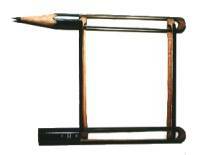 Lately, I´ve been visiting a site with a small section dedicated to "pencil carving". So far, nothing strange: sometimes you find funny shaped decorated pencils in shops too. But in this case pencils were common graphite pencils, which were made unique only by the artistic efforts and great patience of their owners. All the images above were taken from the website http://www.infofreako.com/jad/enpitsu-e.html where more images and some informations can be found. What shall I say... they make me feel like getting some pencils and try and carve some Maori designs!!! See you soon for some more weird tales!